For the last month, during our 30 days of real food challenge, I have been making smoothies a few morning during the week. 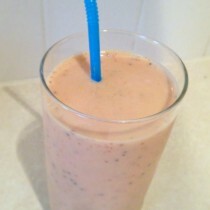 One of my favorites so far is this Strawberry Mango Smoothie. It reminds me of my trips to Riviera Maya, Mexico, especially the trip we got married. My husband and I enjoyed quite a few smoothies at that particular resort’s smoothie bar. 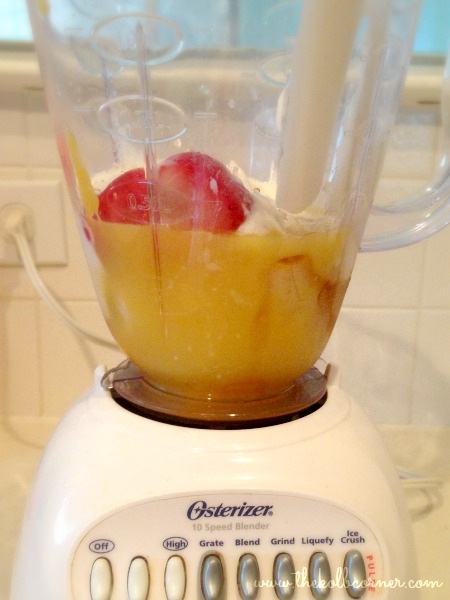 Then add in your Greek yogurt, orange juice, and sweetener if you are using it. 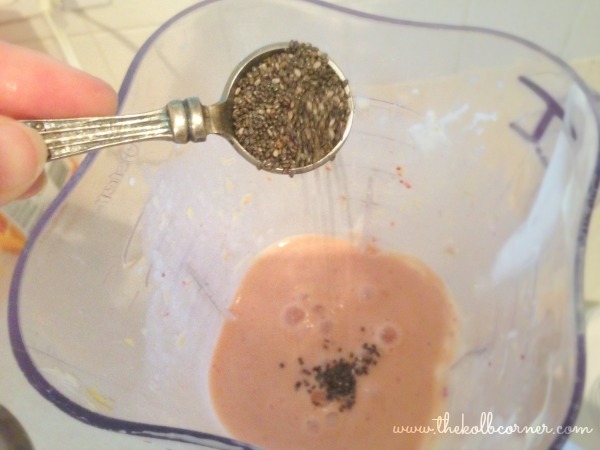 Add in your chia seeds and give it another few pulses to mix them in. I have also heard of people putting their chia seeds in a food processor first to grind the seeds into a powder. 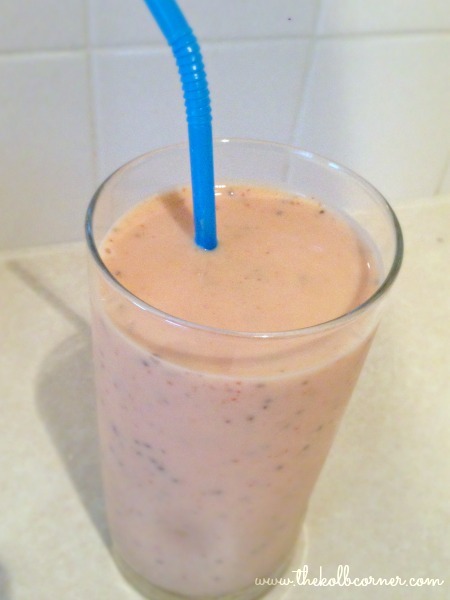 I don’t mind the texture in my smoothies, but if those seeds would gross you out you can grind them up first. 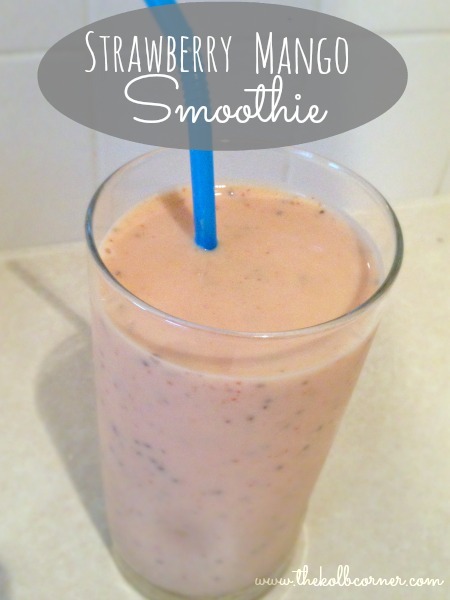 Either way, chia seeds give your smoothie a boost of protein. I’ve even started eating chia seeds with my yogurt and granola in the mornings. 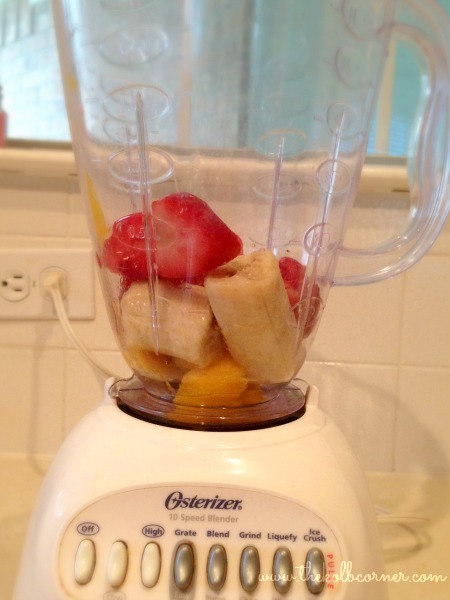 A delicious blend of strawberries, mango, banana, orange juice and greek yogurt. Thanks! I think the Chia seeds in granola and yogurt give it just a little extra something. Hard to put my finger on it, but it’s pretty good! Thanks for stopping by. I love fresh fruit smoothies and I love Chai seed 🙂 Can’t wait to try this out.